Depressive symptoms are common among older adults and can have a major effect on their quality of life. 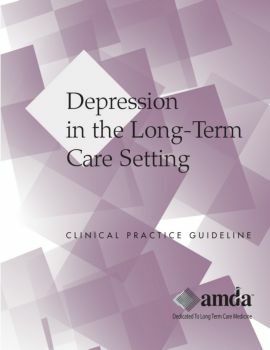 It has been estimated that between 12 and 16% of older adults living in post-acute and long-term care (PALTC) facilities have major depression and 50% may have a minor depressive disorder. This CPG assists the interdisciplinary care team through a process of recognition, diagnosis, treatment, and monitoring of depression in the PALTC facility resident. It includes an expanded section on pharmacology and strategies to assist in diagnosing and managing depression.